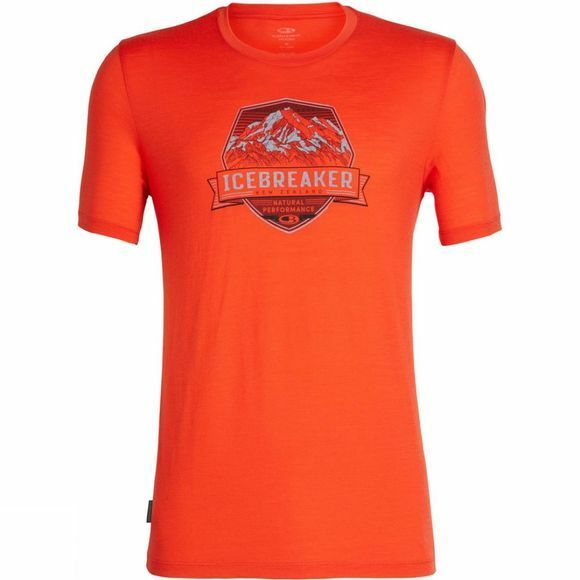 The Men's Tech Lite Short Sleeve Crewe Cook Crest T-Shirt from Icebreaker is the one to choose if you only planing to add one T-shirt to your gear this year. Your best buddy for easy-care, go-anywhere style across the seasons, it's ready for wherever your adventures take you. With its super-comfortable feel and fit, it will see you through hiking new trails, touring the backcountry or scaling peaks. Featuring corespun fibers with a nylon core wrapped in merino wool for added strength and durability, it's naturally odor-resistant and quick-drying, with off-set shoulder seams to prevent rubbing when you're hauling a pack over summits, or across far-flung city streets. The original screen print by Scott Elser adds a heritage look and feel.